(Ani) Hi, Kam. Thank you for having me on your blog (I love the Superman gravatar). 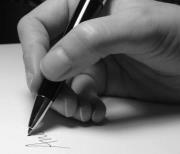 I’m a lawyer by day (please don’t stop reading, it gets better) and a writer by night. I have settled in Portland, Oregon, after trying out a few other places, and I love it here. Rain, green forests, bookstores, and coffee shops… I had no choice but to start writing. J It was something I had always wanted to do—since my first short story in third grade—but “real life” took its course. College, law school, job, family… It wasn’t until three years ago that I finally decided to go for it. I got this idea in my head that just wouldn’t leave me alone. Next thing I knew, I was outlining, then opening an account on fanfiction, then posting chapters online, and the rest became a roller coaster ride. I thought I’d be lucky if I had one or two readers and they’d both like it. I ended up finding quite a few more, then an agent, then a publisher. And now here I am, with my first novel coming out on November 17, 2015. I’m still trying to catch my breath, but I’m so glad I started. Being a writer is one of the hardest things I’ve had to do (and I argue for a living) but it has also been one of the most beautiful and fulfilling experiences of my life. (Ani) Ha ha, this is going to sound really weird, but I actually take a shower. A really hot shower. At the first sign of it. I’m not sure if the hot water relaxes me or what—but some of my best ideas have happened in the shower. And some of my favorite character lines, too. Let me tell you, there were some days when I was taking three showers per day. My husband thought I’d lost my mind (he was probably right). On the upside, I smelled good, so it all worked out. 3. Contrary to what some people envision about a romance writer’s life, it’s not all glitz and glam. Well not for the majority of us. With that bubble sadly busted, when you’re not writing, how do you spend your time? (Ani) Ah the glitz and glam…#someday. My “free time” is a mythological creature, I’m convinced. The more I look for it, the more elusive it becomes. But when I manage to find it, I usually go to my favorite bookstore, Powell’s Books, sit with some hot chocolate in a corner, emanate leave-me-alone vibes, and read the latest releases. When I’m done with that, I will most likely make dinner (I do love cooking), and my husband and I will watch whatever is on HBO. Glamorous, right? To step it up a notch, we are taking a mushroom hunting class this fall. I hope I survive it. (Ani) Yep, I’m a closet writer, too. My family and some of my friends know that I write, but that’s about it. They are very supportive, and I’m really lucky in that regard. My poor husband has had to do the dishes for months on end, and occasionally be my guinea pig for whatever scene I’m writing. And my parents are over the top. They don’t speak much English (I was born in a different country) but from what they can get through Google Translate, they are convinced my book will win the Nobel prize. 🙂 Everyone else thinks I’m a serious, suit-wearing, hose-hating, argumentative lawyer who has an unhealthy obsession with Oxford commas. (Ani) Oh boy, this is a tough one. Can I pick two? Or three? I’m picking two. 🙂 I’d love to see Thirty Nights on it because I think it would make my readers really happy. But it would be hard to cast the main heroine because in my head, she looks like a young version of Liz Taylor. And my alpha hero looks like no one else… but since this is fantasy question, I’ll go with David Gandy (though I know he is in very high demand). As for another book, I would love to see the Fairest series/Lunar Chronicles on screen, by Marissa Meyer. The imagination of mixing fairy tales with cybernetics is kind of genius. I have no idea how they would do it, but I would definitely go see it. It is the first book in the American Beauty series. Its sequel, Ninety Days, is still in the drafting stage. (Ani) I would like to thank my readers who have been there from the first chapter I posted on fanfiction and who have been patiently for the book to come out. There are too many of them to list or name but among all of them, I received thousands of messages that kept me going. I hope other readers who read this interview will also give Thirty Nights a chance. And if they do, I’d love to hear from them. 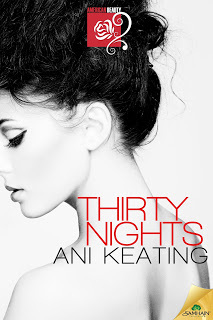 (Kam) I’m sure readers are going to adore Thirty Nights. Speaking of which, lets learn more about the hot read I’m sure fans have been clamoring for. David Gandy is a hottie! Great feature. Please consider leaving a review on Amazon when you do. I read this book when it was called Master's Muse on Fanfiction. It totally rocks and I can't wait to read this version. I'm sure Ani will be thrilled to hear this. Sounds very interesting. I have it on my TBR list. Thank you for sharing!!!! !